Is the Nestle-Aland Bible against the deity of Christ? No! – Open Our Eyes, Lord! It is the narrative in a few remote corners of Christendom that only the Textus receptus reflects the original text of the New Testament. Some would add a second chapter, that newer critical editions – which, in fact, are based on almost 6000 manuscripts, let alone ancient versions and church fathers – are part of a conspiracy to destroy the church’s faith. Their editors are supposedly hell-bent on erasing any Bible verse that affirms the trinity, the deity of Christ, redemption by his blood, justification by faith, and other cardinal doctrines. Or so the legend goes. The evidence for this curious notion simply does not add up. 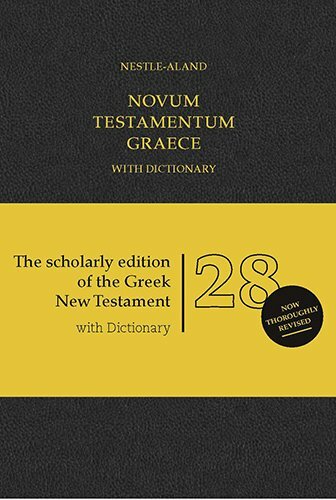 Take a look at the Nestle-Aland Greek New Testament, and you will find all of those doctrines fully and clearly taught; and you will find no evidence of any systematic dismantling of the faith once for all handed down to the saints. This will be evident to those who can read Greek: they can freely access the NA28 online, as well as other information. English readers might look over the ESV on the same quest. And in fact, there is some nice counter-evidence to the theory. It appears in the little epistle of Jude, where the deity of Christ is more clearly set forth in the latest critical edition than it has been in previous ones. First, let’s place the critical version in context. The Nestle-Aland 28th edition (published 2012) has the exact same text as the United Bible Societies 5th edition (published in 2014). They differ in the amount of detail in the textual notes. The NA28 is the standard international text for Bible scholars, while the UBS5 edition presents the text in a format more suitable for Bible translators. Contrary to rumor, NA28 and UBS5 are not the same as the Westcott-Hort edition (1881). These 34 changes were not made willy-nilly, nor in order to forward some theological or cultural agenda – they were based on scholarly analysis of all the data available, put forward in the new edition because the editors concluded that they better reflect what the apostles originally penned. We said that the deity of Christ is advanced more in the NA28 than in NA27 and other editions. This rests on the revised text of Jude 5, shown here in the Greek and then in representative English versions. Again, all three translations have a basis in Greek manuscripts, but the critical text now states that after a consideration of all evidence, “Jesus” now seems the best reading, and “the Lord” a later scribal change. Let’s give some thought as to what this means. In earlier editions and in the Textus receptus, Jude is saying that “the Lord” (Greek kyrios) is the God of the exodus; he uses the same Greek word that the Septuagint uses to translate both Yahweh and Adonai. On the other hand, the NA28 states that the evidence points to Jude having written “Jesus.” He is saying that Jesus – of whom Jude is the servant (Jude 1), the Son of God (2), the only Lord and Master (4), the Lord of the apostles (17), the merciful Lord (21), the Lord who is to be praised along with God (25) – that this same Jesus is none other than the Yahweh God who led Israel out of Egypt. Jesus is fully God. This has a parallel in 1 Cor 10:4 – Israel “drank from the spiritual Rock that followed them, and the Rock was Christ.” This is based on the ancient teaching that Yahweh himself is the rock of Israel: “I will proclaim the name of the Yahweh. Oh, praise the greatness of our God! He is the Rock, his works are perfect, and all his ways are just” (Deut 32:3–4); and as for the pagans: “For their rock is not like our Rock, as even our enemies concede … [Yahweh] will say: ‘Now where are their gods, the rock they took refuge in …?’” (Deut 32:31, 37). For Paul, the rock of salvation is Christ; it was he who went with his people through the desert. As the chorus says: “Jesus is the rock of my salvation” and Jesus is Yahweh God. Jude 5 unmistakably teaches the “pre-existence” of Jesus, that is, that he existed before his incarnation. Deserving to be ranked up with John 1:1 and John 20:28 and Titus 2:13 and others, Jude 5 is now one of the clearest New Testament proofs of the deity of Jesus: Jesus is Yahweh, Jesus is the God of the exodus. We can delve even deeper: if, as I think is likely, the author of this epistle was Jude son of Joseph and Mary of Nazareth, then he is saying that his older brother Jesus is the God of the exodus – the same exodus that Jude and his brothers heard about every single Sabbath in the synagogue! If the editors of Nestle-Aland had as their goal the obliteration of the deity of Christ from the Bible, then they have fatally – and stupidly! – sabotaged their own efforts. A simpler explanation of the facts is that they are not on a jihad against that doctrine; that they are not some hidden cabal trying to usher in the antichrist; and that where the apostles wrote about Jesus’s deity, they wanted to represent that precisely in their Greek New Testament, the Nestle-Aland 28. God is the author of Scripture; let’s read it, uphold it, obey it, share it! http://www.nestle-aland.com/en/home/. One of the editions of the Textus receptus – and there are various, and the TR editions all differ one from the other, is the 1550 Stephanus edition, available here – http://www.bibles-online.net/1550/.